Hawawawa?? Three Mermaid Melody Pure episodes within a month? Let’s just say that the water was building behind the dam, and this outpouring was the aftermath. 😉 And we’re getting close (relatively speaking) to an end, too! [16:27] <@Doll_Licca> Anyhow, the end of MMPPP Pure is within sight… that’s only 8 more episodes. Certainly not an insurmountable mountain! We can do this! <Pours milk over a bowl of Fight-o’s, stuffs them down> Whoo! Okay! Enough of my grumblings! Proudly presenting episode 31 of Mermaid Melody Pure, brought to you by us and our undersea partners over in Licca Fansubs. 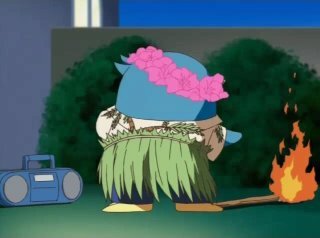 Mermaid Melody Pichi Pichi Pitch 47! Thanks again for the pace of releases lately. Hoping you and everyone are doing well. But, oh, the ANGER when I see Nagisa. My blood boils over every single time. I’m not going to sugarcoat this. Nagisa is the worst character in the series and the interaction, relationship with Hanon is forced. Think about it, his first truly major interaction with Hanon involves him BLACKMAILING HER into a date just to get back what is rightfully hers. Imagine if someone did that to you but you had help like with Rina to prevent it from going through and then the guy has no “bargaining power”… would you seriously end up going out with the guy anyway at any point? WHAT KIND OF MESSAGE DOES THAT SEND? Does this not bother you? Plus, the end-all reason why she does go out with him, from out of pity when he says that it will be as if he failed should she not do so, that is a COP-OUT. I know there is the age gap with Tarou along with the student-teacher taboo to it for why Hanon cannot be with him — even when she is a legal adult, the knowledge that they used to be teacher and student will still be a judgment levied against them if they try to have such a relationship because that is how society tends to be these days — after her unhealthy fascination, but THIS IS NOT A SUITABLE REPLACEMENT. I really and truly feel sorry for Hanon. As a long-time writer, do you know what they should have done? Well, if someone actually likes Nagisa, then let me reassure you that he’s not beyond saving. The first thing would have been for the aforementioned interaction to unfold differently and for Nagisa to drop his attitude… that is, Hanon gets the music right back from Nagisa, THEN he genuinely asks if she would go out with him, partly out of his having found and kept the music safe. That would have been the right way to start off things between them. Even though I don’t see them as compatible — being that Nagisa does not even fit with Hanon’s character type of the “girly girl” — that doesn’t mean they can’t spend some time for mutual benefit and experience, so, secondly, they should eventually agree to see other people who are right for them. This is FAR more believable and realistic because even if Hanon doesn’t end up with a significant other at series end, she is taking the steps to better herself as a woman and eventually work to find Mr. Right. As-is, though, with the questionable actions of blackmailing and acting very immature, out of line, complaining and gaining massive pity, etc… all of that completely rubs me the wrong way and it screams “forced” if you just step back and critically analyze it. They get Rina and Masahiro right, but Hanon is stuck with this relationship? She deserves better than this, don’t you think? Now, however unpopular this opinion might be with other long-standing fans of the series, I STAND BY MY VIEW and will defend it. But I’m just putting it out there for you all to read. I believe my heavy dislike of Nagisa is justified. My apologies for the time taken to read all this. I have to say while you do have very good points…. Thanks again all these releases Wasurenai-subs/Licca Fansubs!!!!!!!!!!!!! Well, yes, I can see to that “finding love in the last place one looks” thing, but after that HORRENDOUS first impression of Nagisa’s with the underhandedness of what he does… wouldn’t you immediately tell him to stay away from you if you were in her position? Even after his coming to admit he was wrong to behave that way, it takes time to gain back trust. I’m not saying it’s impossible to turn over a new leaf on the quick, but it’s hard to truly convince someone of that kind of change. Certainly Nagisa does become THE LAST one after every other guy in the area. Then again, Hanon doesn’t make to really approach the effort to try and actively seek partnership through going on dates with other guys, like what the narrative really should have done… had that happened and Nagisa attempted to do things in a genuine sense to improve himself and get her to notice him the whole time, then I might concede to an endearment element here, one that isn’t born out of pity. By virtue of timing, if that “last guy” thing happens here in this episode and thus he makes to defend her from Lady Bat, then that may indeed win him over in her eyes. Still, that having been said, I just don’t see the two of them working out in the end from even that approach. I am really hard to convince to move from my position, but I am able to see your viewpoint and I gave my idea for a saving grace. It is just that the magnitude of difficulty in seeing it come to happen is the deal breaker for me. But you may well be right in that a male with somewhat of an aggressive stance is best to keep up with Hanon… he just needs to be a little older, I think. Hanon best gurl. I do not watch mermaids though.